Before Lon Chaney ever set his furry paws on the foggy moors of Wales, Universal offered up its first telling of the werewolf legend in Werewolf of London (1935). An entirely enjoyable film on its own right, Werewolf of London is not the very first film to deal with skinwalkers. That honor goes to either the lost silent The Werewolf (1913) or the rarely seen Wolf Blood (1925). But it is the first to create a fully fleshed out story, and helped in the creation of the now classical angst-ridden character dealing with the monstrous disease of lycanthropy. Botanist Wilfred Glendon (Henry Hull) travels up the snowy mountains of Tibet to retrieve a rare flower: the Mariphasa lupina lumina. Just as he’s about to stake his claim, a ferocious creature tackles Glendon to the ground, taking a bite out of his arm before Wilfred can ward him away with a knife. Returning to London, Glendon attempts to make the flowers bloom by using artificial moonlight. His intense devotion to his work causes him to neglect his wife Lisa (Valerie Hobson) who seeks comfort from an old beau, Paul (Lester Matthews). At a botanist social, Glendon meets the mysterious Dr. Yogami (Warner Oland) who knows of Glendon’s discovery and warns the doctor of the werewolf’s curse, a stigma whose only antidote is the moon flower. Yogami also gravely intones that the werewolf seeks to destroy what it loves best. Glendon refuses to put stock in superstitions but becomes alarmed when his arm grows coarse and hairy under the artificial moonlight beams. He finds out the true nature of his condition later that night as he completely transforms into a ravenous monster of the night. Seeking Lisa out at a party, the werewolf breaks into the room of her gossip Aunt Ettie (Spring Byington) before tracking down a woman in the foggy streets. With Glendon’s distress on the rise and his emotions in disarray, he rents a room in a seedy pub to keep the beast inside of him at bay. But the night brings the monster out and Glendon jumps through the window, hunting down another woman in a zoo. Yogami has gone to the police to warn them of the potential epidemic that may arise from the curse of the werewolf but they disregard his urges as folk tales. Meanwhile Glendon has taken extreme measures to keep himself from harming anyone, especially his beloved Lisa. Travelling to the castle estate of a friend, Glendon locks himself away in a tower. But nothing can stop the werewolf when the moon rises, as the beast tears away the bars and leaps to the ground, attacking Lisa as she walks on the grounds before Paul is able to fend Glendon off. A disheveled Glendon makes his way back to the laboratory to use the last of the Mariphasa buds to alleviate his disease. Yogami beats him to the punch and it is revealed that the fiend was the very same monster that attacked Glendon in Tibet. Glendon transforms again and, in the ensuing struggle, slays Yogami. The werewolf heads over to the house and begins to terrorize Lisa and Aunt Ettie. It is just about to sink its fangs in Lisa when the police arrive, gunning Glendon down and delivering him from his curse. Werewolf of London is sprinkled with an eccentric streak of humor, in some ways similar to the tone of The Invisible Man (1933). The kooky British characters energize the film with comedy that benefits, rather than detracting, from it. The banter between everyone, from the stuffy upper crust to the wine-imbibing landlords, is sharp and spot-on. 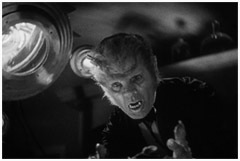 Henry Hull gives a fine performance, displaying the pathos needed for the tragic werewolf character while retaining the prim and proper characteristics of an English gentleman. Hull and director Stuart Walker worked together previously on the adaptation of Dickens’ Great Expectations (1934). Walker himself would go on to direct only one more feature before producing several of the Bulldog Drummond films. Valerie Hobson (who was also in Walker’s 1935 adaptation of The Mystery of Edwin Drood) gives an adequate turn at playing Glendon’s distressed wife. Her lines come off a little stilted at times, but her lovely set of vocal chords make for some nice bloodcurdling screams later on. Warner Oland is a familiar face to genre fans, having made himself a household name in the 30’s as Oriental sleuth Charlie Chan. He hands in a nice performance here, each restrained line of his is perfumed with a slight air of mystery and foreboding. The makeup design by Jack Pierce is unique and distinctive, a fearsome creation that could rival Pierce’s later work on The Wolf Man (1941). 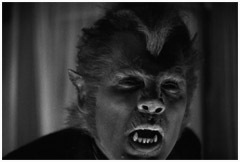 Interesting to note, Pierce originally designed the legendary Wolf Man makeup for this film. But Henry Hull was displeased with the time-consuming application and declined on wearing it. To appease the actor, Pierce concocted a design that was less hairy in comparison, thus giving us the werewolf we have all come to recognize. 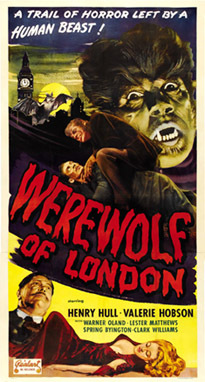 Good direction, fine performances, a foggy London setting, and an intriguing storyline all blend together to make this ferocious beast a great evening of chilling entertainment. This film is a must for all lycanthrope lovers and genre admirers.